Perfect for carers to treat those who need extra care. 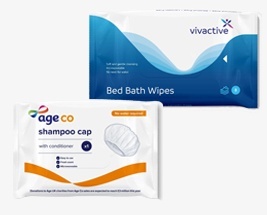 Our range of Bed and Bath products can be used to cleanse, moisturise, deodorise and offer anti-bacterial and barrier protection. Our range of incontinence wipes come in a variety of sizes to meet your every day needs. For other care products including wash creams and lotions, see our Creams, Lotions, Mousse and Foams Range.